Bernina is a sewing and embroidery company which was originally founded in Switzerland in 1893. They have a long history of making high quality sewing machines and other embroidery equipment, and are renowned in the industry. We have currently reviewed one of their machines, it’s a great machine and probably the most expensive one you’ll find on this website. It’s worth having it here so you can see how it compared to the other brands and models that we review. 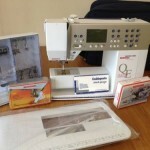 Review: Bernina Aurora 440QE Sewing Machine- The Bernina Aurora 440QE sewing machine is a computerized sewing machine. The machine performs both embroidery & sewing works. This particular model generated a lot of interest from the time it entered the market. Let us go through the pros & cons of the machine briefly.